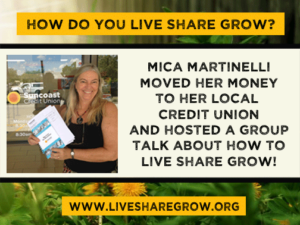 So… I first gathered five friends, besides my husband and I, to discuss the ideas proposed by Live Share Grow. All of us were already engaged in at least one of the Five Constructive Actions so we shared what we were already doing. We suggested that each of us look into what we could do next and took action. My husband and I started buying our groceries more locally than what we did before. This has been more work but very rewarding. We are in the process of moving our money out of Bank of America. We have several ties with that bank (IRA, CDs, bill pay, business account, etc) so it’s taking a while and several steps, but we have been doing it and half of our money is already out. It isn’t that much but it’s the little we have for our retirement money – pretty important! We now have an account with our local credit union. Loving and sharing we’re growing!